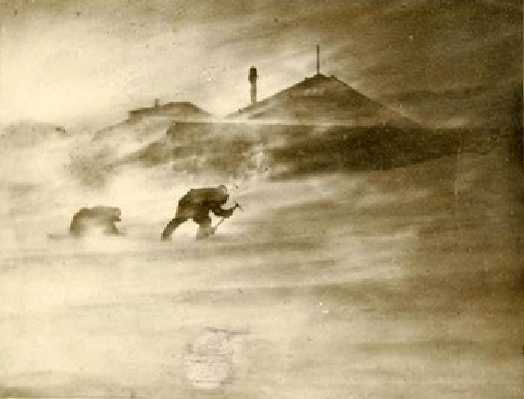 "For nine months of the year an almost continous blizzard rages, and for weeks one can only crawl about outside the shelter of the hut unable to see an arm’s length owing to the blinding snow drift…"
It was the first Australian expedition to Antarctica and Australians managed to land and stay (and persist!) 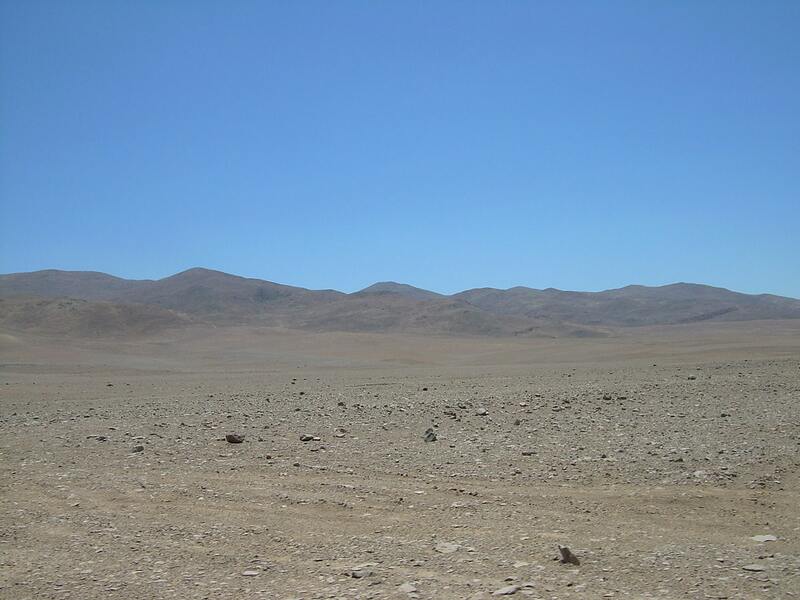 in an incredibly inhospitable place. Nowadays Commonwealth Bay and especially Cape Dennison is considered to be the windiest place of the world. Cape Denison is isolated rock at the the icy shores of Commonwealth Bay. This rock is some 900 by 700 m large and surrounded by nearly endless ice plain – the giant East Antarctic Ice Sheet. Distance to the South Pole is some 2,560 km – only a small bit closer than Tasmania. Commonwealth Bay is approximately 60 km wide bay. Cliff of Cape Denison is located roughly in the centre of this halfmoon-shaped bay. 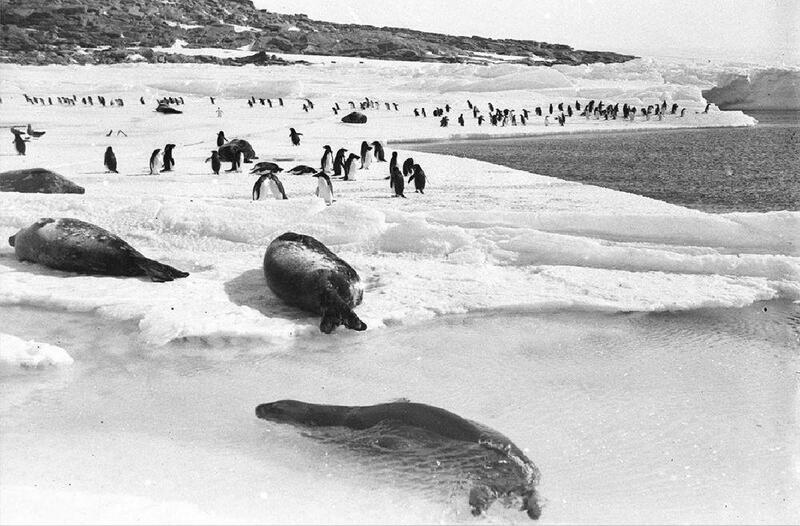 Cape Denison, penguins affter blizzard. Life here continues in spite of winds exceeding 320 km/h / Frank Hurley, 1911-1914, State Library of New South Wales. Ice cap here is rising like a giant amphitheatre. 1 kilometre from the shore ise rises some 50 – 90 metres above the sea level, 10 kilometres far – some 500 metres and 20 kilometres far – some 650 – 700 m high. Thus – as the ice approaches the sea, the surface of plain becomes steeper and steeper. 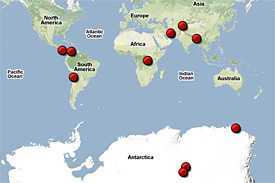 Central areas of Antarctica are not windy. In opposite – these endless plains of snow often are dead silent. Surface of snow here is extremely cool – even as cold as -60°C. In the centre of Antarctica ice shield rises up to 4,100 m above the sea level. Closer to the sea the height of ice gradually decreases. The cold air flows down the ice slope by the force of gravity like a giant stream. Such movement of air is called – inversion wind. As it approaches the sea, the ground becomes steeper and wind – faster. Summer in Cape Denison / Frank Hurley, 1911-1914, State Library of New South Wales. 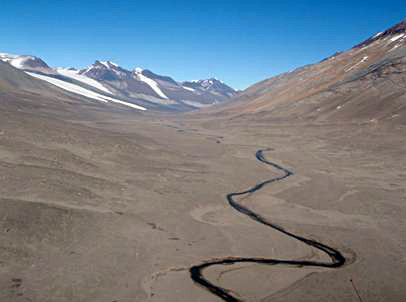 When the smooth flow is disturbed by some monolithic cliff rising from the ice field or some ridge or valley, the movement of wind may become faster. Wind becomes very strong also close to the see, when the surface of ice shield falls even faster. Such wind already is similar to an avalanche and is is called katabatic wind. Katabatic wind was known before the research of Antarctica, but nowhere else people have met such a powerful wind of this kind (katabatic winds in Greenland have comparable power). This strength can be explained by the halfmoon form of the bay – streams of air are squeezed here together and thus forced to flow faster. Right at the spot where the speed of air is at its fastest, in the middle of this powerful stream is located the rocky outcrop of Cape Denison. Thus the fast flow of air around this rock becomes even faster. 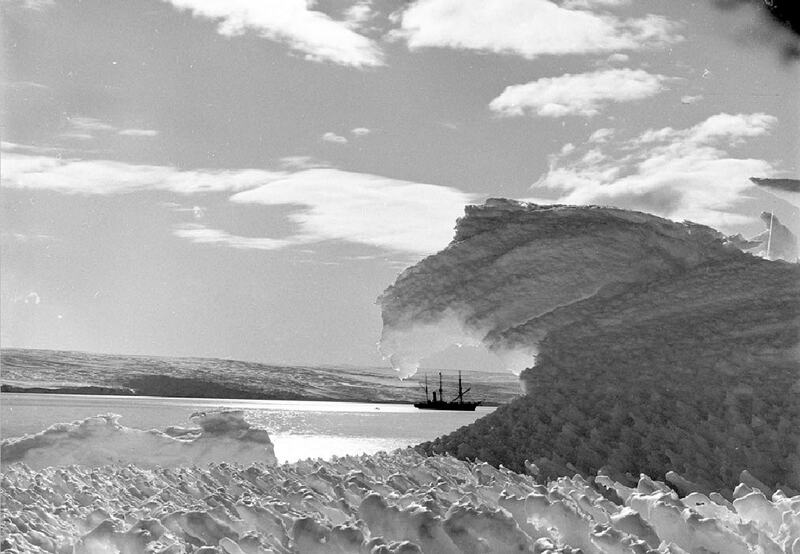 Shore ice at Cape Denison and "Aurora" / Frank Hurley, 1911-1914, State Library of New South Wales. Mean annual speed of wind at Cape Denison is 80 km per hour (22 m per second). Meteorologists consider that storm begins at 24.5 km/h – thus the mean weather in Cape Denison is almost storm, and, as this is Antarctica – this storm is very very cold. "Having failed to demolish us by dogged persistence the gale tried new tactics on the evening of May 24 (1913), in the form of a series of Herculean gusts. As we learned afterwards, the momentary velocity of these doubtless approached 200 miles (320 km) per hour." His team was impressed and worn out by these impossible hurricanes lasting for days. Heroic 18 men of his Australasian Antarctic Expedition stayed here in the winter in 1912 and seven people – in 1913. They had to endure such storms which no one had experienced and survived to tell about – for example long lasting 180 km/h wind at -30°C cold. Huts (Mawson’s Huts) of these hardy explorers have been preserved here up to this day and belong to most valuable historical monuments on continent. Powerful winds strip away the snow from the surface of ice shield and expose the old, blue ice. There are formed ridges in the ice which show the dominant directions of wind – they are called sastrugi (from Russian). Beginning of these extreme hurricanes often is unusual – there might be absolutely calm weather and then in few minutes unexpectedly starts extreme wind which lasts for many hours and then again stops, as if switched out. These fast pressure jumps create small but very violent whirlwinds of snow and a characteristic short-lived and quick cloud disappearing above the sea. It is observed that these extreme winds quickly loose their strength above the sea. Weather on the coast can be very diverse – at one spot it can be relatively calm but few kilometres further there might be a strong storm raging for hours. While in summer here might be enjoyed periods of calm weather, winters are especially bad – then temperature falls and storms are almost endless. 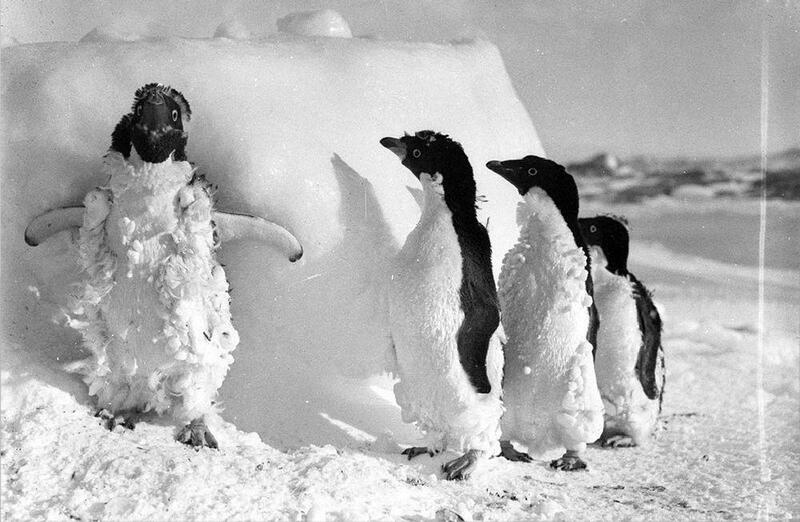 In spite of extreme weather conditions, the coast of Commonwealth Bay contains breeding colonies of emperor penguins and Adelie penguins, as well as the largest colony of Antarctic petrels with 158,000 breeding pairs and numerous other birds. Australian Antarctic Division, Living&Working Mawson Station. Accessed on September 26, 2010. F.K.Ball. The Katabatic Winds of Adelie Land and King George V Land. 1956.